It will be a decade or more (definitey more) before the Parliamentary Dining Room reopens in Centre Block with its cosy alcoves and river views...and its delicious buffets. Until then, the Dining Room has moved to a cozier underground location in West Block. They were open last week to work out the kinks before the Parliamentarians return, so a friend and I went over for lunch to check it out. As I said, it's cozy. Maybe a quarter of the size of the Centre Block location. So, no room for the popular with staff Friday buffets which regularly sold out. When I had my first tour of the building a few months back, the lighting was dim and I said it felt like a wine bar -- the big wine rack helped. With the light on that ambience was gone, and it was just a windowless, buffetless, brightly-lit cave. Fellow dinners complained the modicum of privacy in the old location was lost. I felt they should have dimmed the lights back down. Complaints about the space aside, let's turn to the menu. 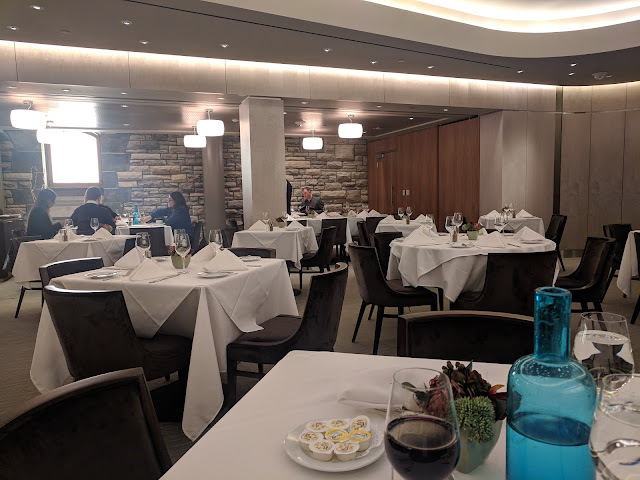 As mentioned, I was a buffet fan so I wasn't super familiar with the old a la carte menu, but I did recognize a few holdovers -- the salmon is still on there -- as well as some new additions. The Brussels Sprouts appetizer sparked a conversation on pluralism with my dining companion -- brussel sprouts or brussels sprout? I hope its like Governors General. But either way, it's not on my plate. I went with the dish that is rather unimaginitevly titled on the menu as "Seafood." Rather unimagenitvely named, even if it does fit my see food diet. Thankfully, there was a description: lobster, shrimp & scallops, forbidden rice, lobster velour. For $23 it came with a house salad -- tried to move for a substition for ceasar, but consent was denied. I forgot to take a picture, but here's the empty dish. 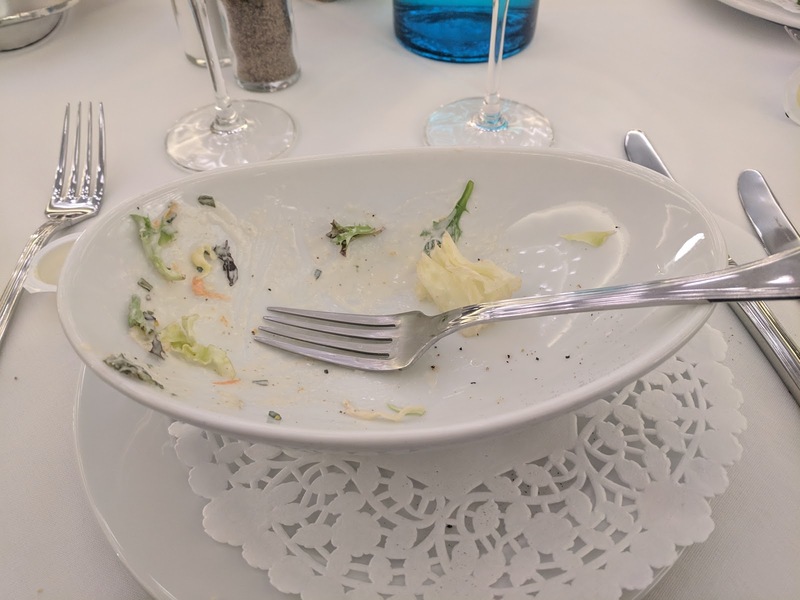 It was a house salad, what do you want? Lettuce, carrot, dressing, you've seen one before. It was fine. If they'd added shaved parmesean it would have been excellent. Black rice, also called forbidden rice or "emperor's rice," is gaining popularity for its high levels of antioxidants and superior nutritional value. Forbidden rice earned its name because it was once reserved for the Chinese emperor to ensure his health and longevity, and forbidden to anyone else. Forbidden rice is a medium-grain, non-glutinous heirloom rice with a deep purple hue and a nutty, slightly sweet flavor. The "Seafood" dish was as described. 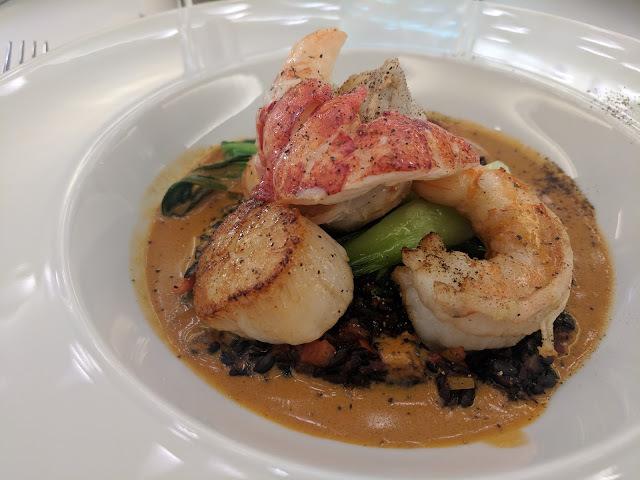 A nice portion of lobster, several seared scallops, several large shrimp, and assorted veggies with black rice in a tasty sauce. Not a huge dish but well-prepared and quality seafood, even if it probably wasn't from the Pacific -- the best ocean. The rice was crunchier in texture than white rice and indeed, a little nutty. Didn't make me feel like a Chinese Emperor, but it was a tasty dish. Well executed. I think I saw most of the lunch patrons ordering it. I was still hungry for a non-included dessert, though. 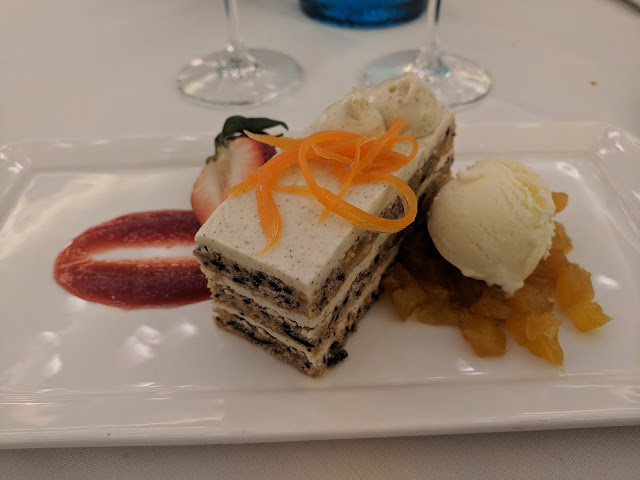 I went for a $10 piece of carrot cake, which the menu described as being accompanied by: spiced pineapple compote & goat cheese ice cream, strawberry splash. I like carrot cake. There's a carrot cake in the dessert rotation at the cafeteria that I often have when it comes up. This one was...different. Maybe it was the layers that thre me off, or some ingridient in the cake layers. But it didn't much taste like trditional carrot cake to me. The goat cheese ice cream, though small in portion, was creamy and enjoyable though the pineapple compote didn't taste fresh. It was a meal that left me full and satisfied, but at these pricepoints I will not be a regular in the West Block dining room. It's not any pricier than it was befre, but the $20 all you can eat Friday buffets were the budget-friendly staff option. The a la carte lunch will be a very rare treat indeed.